West Windsor, N.J. -- Mercer County Community College is lining up sponsors to participate in the 2009 National Junior College Athletic Association (NJCAA) Division I Men's Soccer Tournament to be held November 19-22, 2009. An opening night banquet will be held on November 18. The tournament returns to the MCCC Soccer Complex for the first time since 1999. According to Athletics Director John Simone, eight teams from across the country will vie for the title, with approximately 300 players and coaches estimated to participate. Thousands of spectators are expected to visit the stadium over the four days of competition. 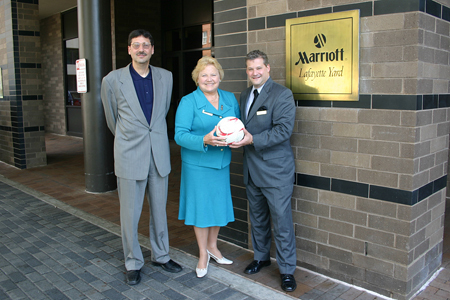 MCCC Athletics Director John Simone, President Patricia C. Donohue and Marriott General Manager Jeff Zeiger. Sponsors thus far include NJCAA Region 19, the Garden State Athletic Association, the Trenton Marriott, which has been selected to house the visiting teams, Stout's Charter Service, which will provide transportation, and Baden Sports. Marriott General Manager Jeff Zeiger says, "It's fantastic that MCCC and the Marriott are partnering for this event - bringing the tournament to the area and building business in Trenton. Everyone wins." Adds MCCC Head Men's Soccer Coach Charlie Inverso, "The tournament is back at its best venue -- Mercer. The last two host schools did a phenomenal job, but they could not provide the large passionate base of soccer fans that we have in this region." Inverso recalls the Vikings' 1991 championship win against Yavapai Community College, which was played before thousands of fans. He notes that the tournament is a great opportunity for youngsters who play in community leagues to see quality soccer at the collegiate level. MCCC's men's soccer program is recognized across the country. The Vikings have won eight national titles, five of them under Coach Inverso, who begins his 24th season with the Vikings this fall. Last year the team placed third nationally; its last national championship was in 2004. Area businesses are invited to serve as tournament sponsors. Sponsors' names will be posted to the tournament and college websites, featured in the program book, and announced at the games. For more information on sponsor opportunities, call (609) 570-3778. Read the latest MCCC Sports News here.